Oracles egg #4 has hatched with the Tickbird Hatchling. That's 2 of the 3 pets from the Oracles Egg. Still no mount yet of course, but I'm on my way to go buy another egg. I hope everyone is enjoying their Christmas and has a wonderful day and good company. 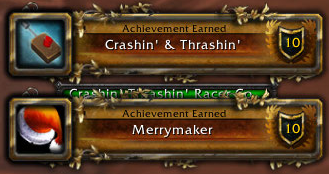 Of course, with Christmas comes the presents, so I woke up early to open mine, got my Crashin' Thrashin' Racer, and proceeded to destroy 25 cars to earn my Merrymaker title. 2 down, 10 to go. After putting some time into crafting an all-in-one list that outlined the upgrades I needed from Naxxramas (10) and Heroics, I was duly rewarded last night with a drop in heroic Azjol-Nerub of Stone Worn Footwraps (the Rod of the Fallen Monarch continues to elude me (currently the best wand in the game until 25-man content)). Also, Azjol-Nerub happened to be the heroic daily, so after collecting my three emblems in Azjol, then two for the daily, I was at exactly 80. And that means...new robe! The Heroes' Frostfire Robe is mine. It has been socketed with Runed Scarlet Ruby and a Veiled Monarch Topaz. Basic theorycrafting states that two rubies would have given me the most DPS, but I just lost my Leiah's Footpads and their 43 hit, so I've been a bit lacking. And even though my Frostfire Bolts all hit, I'm missing with Pyroblasts (Hot Streak), Scorches, and Fireblasts (while moving). So it's something I really have to work on bringing back up. Plus, throwing in two rubies would lose me the socket bonus as well, so I'll take that +6 hit there as well. So right now, I'm sitting pretty. 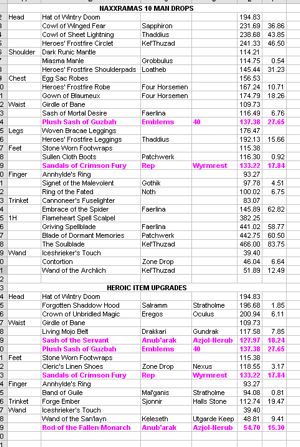 My Naxx (10)/Heroics list only has a few more items that are must-have upgrades. From heroics, I would greatly like the Sash of the Servant (again from Azjol-Nerub) and the Forge Ember from the Halls of Stone is a nice trinket upgrade. 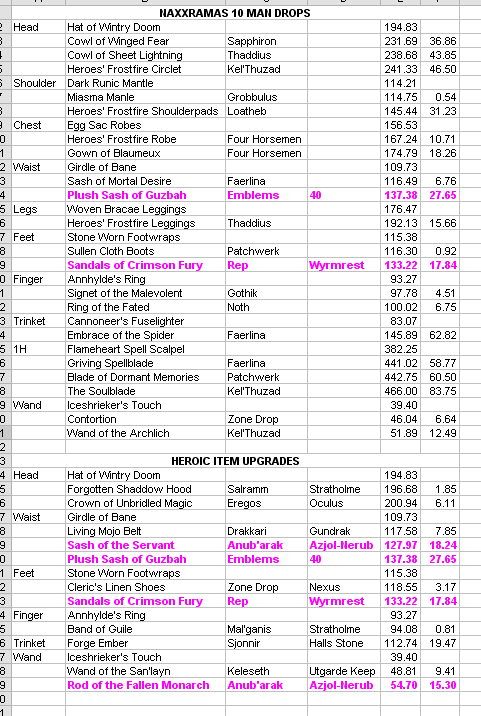 From Naxx (10), I'm looking for a huge helm upgrade from either Sapphiron, Thaddius, or Kel'Thuzad. I'm hoping for the Tier 7 shoulders from Loatheb, and Tier 7 pants from Thaddius. Grand Widow Faerlina, Patchwerk, and Kel'Thuzad all drop huuuuge weapon upgrades, but the one thing I want more than any other is the Embrace of the Spider from Grand Widow Faerlina. It dropped for us last time around and Eirama won the roll (a very nice upgrade for her as well). That about concludes what I am gunning for in the near future. Fingers crossed!